While Chicago might not be able to accommodate extreme mountain bikers looking to chew up some trails, there's no shortage of seriously awesome pathways for riders of all levels. We've rounded up the most accessible, semi-challenging, and fun routes in the area -- working in beautiful lagoons, culture detours, and brewery pit-stops along the way. 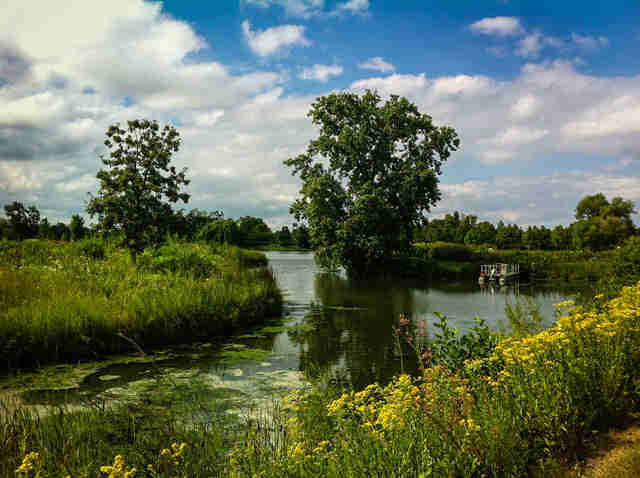 Even the laziest of pedalers will be equipped to handle some of these trails as they stretch across Chicagoland's wonderfully flat terrain. Start at North Shore Channel Trail at Devon Ave and McCormick Blvd, end at North Shore Channel Trail at McCormick Blvd and Dempster St. 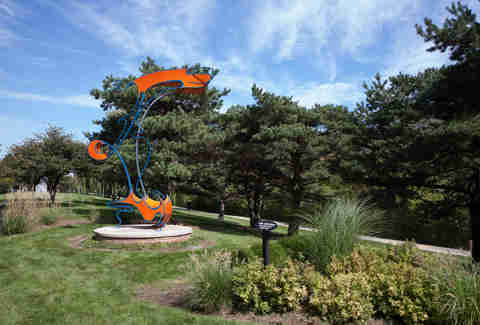 The highlight of the North Shore Channel Trail's suburban segment, which continues to run adjacent to the north channel of the Chicago River from the city, is a two-mile stretch from Touhy to Dempster packed with 60+ works of art along the Skokie Northshore Sculpture Park. Take a self-guided tour of the unusual sculptures as you go. For an added challenge, extend the ride beyond the sculptures up the path through the Ladd Arboretum in Evanston. 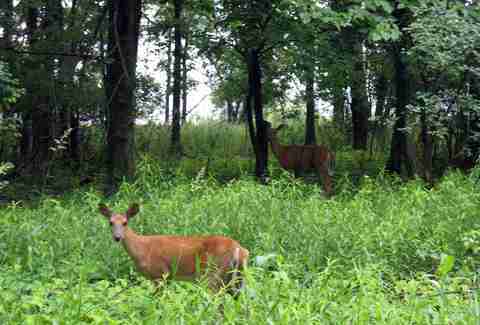 The Des Plaines River Trail offers a quick wilderness fix for those who want to breeze through a portion of the 60-mile trail that cuts through the many forest preserves in Cook County and Lake County. Head north from Schiller Woods access point near Irving Park Rd along the unpaved path to watch wildlife like blue herons, beavers, and foxes under a canopy of old-growth trees. More experienced off-roaders can take offshoots that'll eventually return to the main trail. Head back when you hit Algonquin Rd in Des Plaines. Explore the beautiful Baha'i temple (the only one in North America is conveniently located in Wilmette) before setting off for one of the city's best-designed spaces. 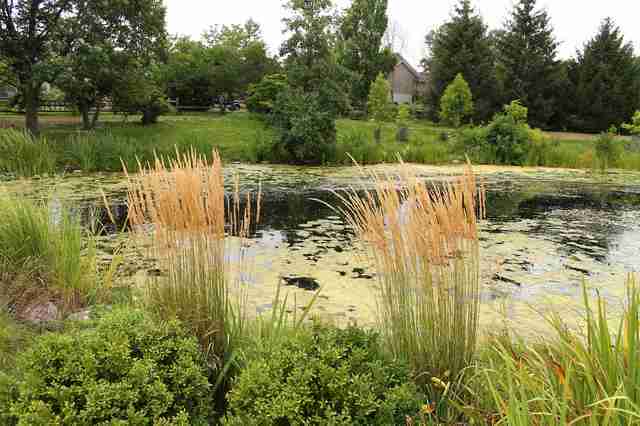 By way of Sheridan Rd along the lake or the easy, crushed stone Green Bay Trail, you'll eventually cut over to the North Branch Trail, which will wind through the Skokie Lagoons before rolling into the stunning 385-acre gardens in Glencoe (entering on foot or bike gets you in free). Too exhausted to pedal back after strolling through the greenery? Luckily, the Metra’s Braeside stop is just a stone’s throw away. The least intimidating pathway in the city, the Bloomingdale Trail (aka the 606), is even more manageable with its bevy of fine eating/drinking options along the way. With less than three miles one direction -- stretching through Bucktown, Wicker Park, Logan Square, and Humboldt Park without street traffic interruptions -- you can basically cruise the elevated trail back and forth for hours, starting with a hearty breakfast skillet (for energy!). And remember to take this one reaaaaaal slow, so you don't cramp up from all the mid-ride oatmeal shakes at Irazu and end-of-the-rail martinis, OK? For those who loathe backtracking, the popular paved trail within the 3,700-acre Ned Brown Forest Preserve (fondly known as Busse Woods) in northwestern Cook County loops around a 590-acre reservoir. You'll pass through thick groves of oaks and maples and cross bridges over Salt Creek, and can even take a break for an up-close look at elk grazing in the pasture. 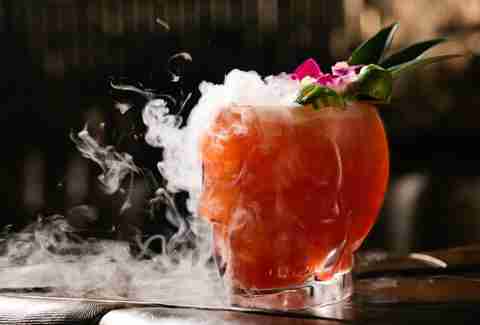 Warm weather and tropical drinks go hand in hand, so this "trail" via city streets hits a few of our favorite Polynesian destinations -- of which there are many in Chicagoland -- along the way. Start your mini-vacation at the Tiki-themed speakeasy Three Dots and a Dash for painkillers and coconut shrimp. But take it easy: your next stop will be Lost Lake for a rum-drenched Bunny's Banana Daiquiri. 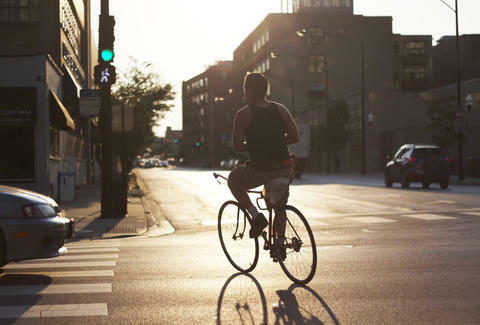 Get there by pedaling south on Clark St, west on Kinzie St, northwest on Milwaukee Ave, and north on Kedzie Ave. Follow up with Hala Kahiki Lounge in River Grove by huffing west on Diversey, cutting over to Grand Ave, and turning right on River Rd. From here you can take the nearby Metra train back after drinking your share of booze-filled frozen pineapples or end the evening with an action-packed luau show (the Des Plaines River Trail leads to The Tiki Terrace further north in Des Plaines). 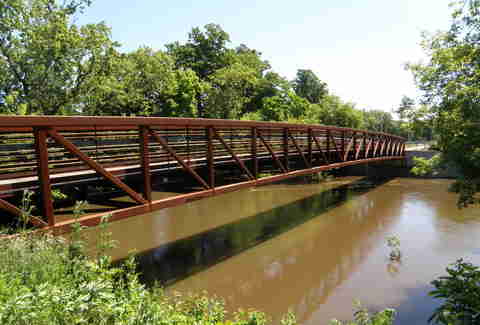 Even experienced riders welcome the relatively new, multi-purpose stretch of the Cal-Sag Trail in the city's south suburbs in Palos Park. 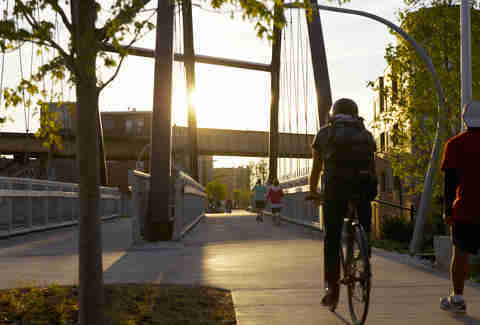 Eventually, the pathway will expand to 26 miles and connect to other trail systems like the Centennial and I&M Canal trails to the west to the Burnham Greenway to the east. Riders can take in the landscape diversity along the Cal-Sag Channel, including some hills. Park near Archer Ave and Calumet Sag Rd in Lemont or access the trail via Sag Quarries, Teason’s Woods, among other spots. Beer geeks can meet up at the Museum of Science and Industry before departing on a 40-mile lakefront ride from Downtown to one of Indiana's best brewpubs. The Lakefront Trail gives way to streets on the city's South Side before connecting to the Burnham Greenway, Wolf Lake Trail, and Lake County Monon Trail, which will carry you over to 3 Floyds for top-notch beers on tap and a few rarer bombers to stockpile. Push through the urge to nap by first biking another 10 miles west to Flossmoor Station Brewing Company -- conveniently located at the Metra stop -- for another growler to share on the train back to the city (remember to politely ask for disposable cups). You can at least tell your friends you biked all the way to Indiana just for some beer, even if you couldn't pedal your way home. 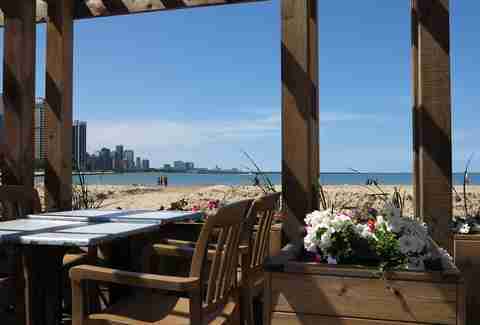 Make an afternoon of beach bar-hopping on the lake, starting with the patio at Waterfront Café in Edgewater. From there, you'll have several waterfront options for snacks and drinks while leisurely riding south along the Chicago Lakefront Trail, including The Dock at Montrose Beach, Castaways at North Ave, Oak Street Beach Food + Drink, Caffe Oliva at Ohio Street Beach, and The Cove Lounge near Promontory Point. A lemon pepper catfish dinner with a side of fried shrimp at Calumet Fisheries on East 95th St will complete your "seaside" experience. Catch a train at the nearby South Chicago (93rd St) Metra station to get home. Fuel up with some local java and make sure your bike is in tip-top shape in Uptown before making an all-day trek up north. Weave your way through city streets up to the North Shore Channel Trail, then cut over to the Green Bay Trail, which will turn into the tree-lined Robert McClory Bike Path as you head through manicured North Shore suburbs and relaxed countryside. 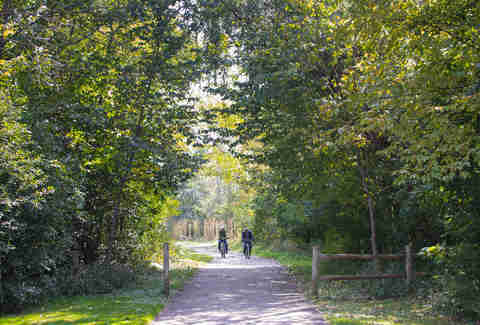 Tack on lagoons and forested landscape to your urban jungle journey by linking up with the North Branch Trail in lieu of the straight-shot via Green Bay Trail before hitting the Robert McClory Bike Path the rest of the way to Lake Bluff (note: this route will add a couple miles). Grab some pub grub and a cold one at Lake Bluff Brewing Co. before hightailing it home. Nicole Bruce is a contributing writer for Thrillist. She'll happily hop on a bike for more than 30 minutes if there's promise of a refreshing beverage at the end of the road. Find her on the Twitter at @nicoleabruce.